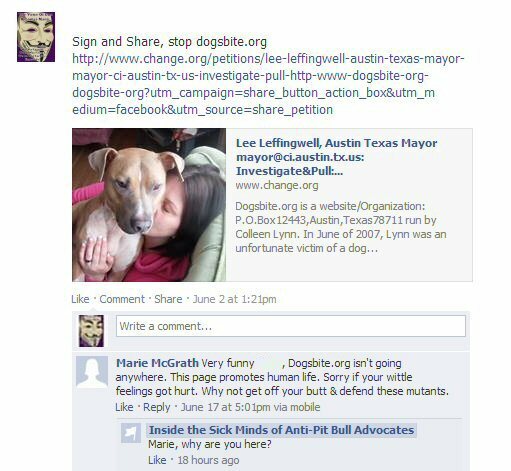 My friend shares a petition on a page for the defense of Pit bulls, and this woman Marie casually comments like it doesn't mean anything. Marie, If you must know the only feelings hurt were yours and DBO's founder. Then again we all know truth hurts doesn't it? So, I'll ask. 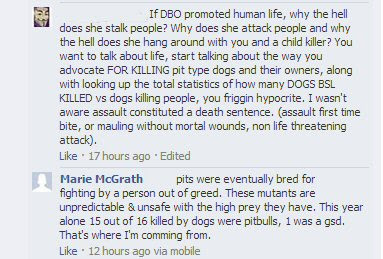 If DBO supports human life, why does she stalk and attack people, along with affiliating herself with a known child killer and people like you? Fair question, would love to see it answered. Pit's do not have a high prey drive sweety, unless you consider their origins of HERDING high prey drive, then again they don't kill live stock unless TRAINED wrong. I believe we covered this before unpredictability are caused by the dog fighters who train and breed their dogs to be aggressive... 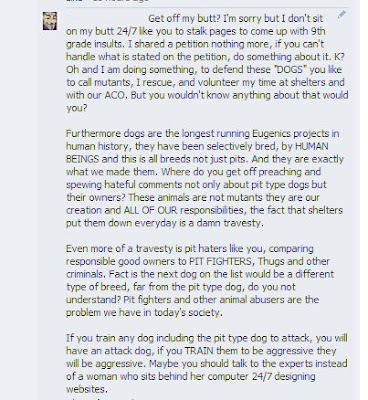 It is the dog fighters fault that we have this problem. Do some research Marie. 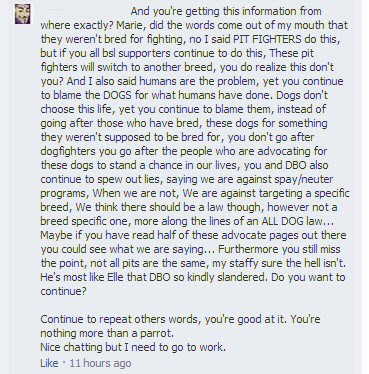 I surely didn't see you say they weren't bred for fighting, I saw you clearly state that Dogfighters - Pit fighters do this. Which is fact, yet you are correct Marie is missing the key points that you have stated. This is what advocates deal with on a daily basis from these haters. The illogical spurting of falsified statements. Marie I do believe you have a nickname don't you, Something along the lines of Mad-dog? I wonder why that is. Like my friend stated, keep repeating you are doing a great impersonation of a PARROT.